There are RPGs that command attention with each new release. Final Fantasy, Dragon Quest, even (to a lesser extent in the States) the Tales of series. Then there are RPGs that, while exceptional, fly under the radar for whatever reason: maybe limited marketing budgets or an assumed niche appeal. The Trails series fits that description to a T. In Trails, Nihon Falcom and localizer XSEED have crafted a living world full of history and mystery, an ever-evolving and compelling combat system, and characters that are just as lovable and nuanced as those in your favorite anime. 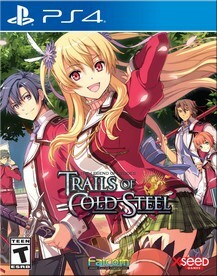 Trails of Cold Steel, originally released for the PlayStation 3 and now hitting the PS4 in a definitive edition, is a fantastic jumping-on point for series newcomers. Like all the games in this series, its plot doesn't lend itself well to a quick synopsis, because there's just so much going on. At its core, Trails of Cold Steel is about the Thors Military Academy, specifically Class VII, a group of elite students being trained in the art of warfare. Your main character is Rean, a hardworking young man who finds himself placed in Class VII along with a cast of eclectic characters. With his country of Erebonia on the brink of war, Rean and the others find themselves caught up in conflicts that are way above their pay grade (which is technically zero, since they're students, but you get what I mean). And all the while, a mysterious organization is pulling strings to use an ancient technology for their own devious ends. Many games like this would choose to focus on the mystical, but Trails of Cold Steel relegates most of that to the background. Sure, there's magic and an ancient race with mysterious technology, but we're most interested in these characters in the here-and-now, their trials and tribulations in school and on the battlefield, and the broader political upheavals happening around them. As this is a game with strong continuity to its sequels (the first of which is being re-released on PS4 soon), there are tons of intriguing plot threads that start here and get no satisfactory resolution. Some would consider that a negative, but I'm here for it. This is a game series that's more like a TV show in the way it tells its story. There are cliffhangers galore, and the end of the game (like the end of a TV season) wants to keep you intrigued so you'll come back for the next one. Having played the first two games on PS3, I can say the story was clearly planned from the beginning, with interesting little asides paying off in the next installment. Just be aware that, to have a fully satisfying experience with this story, you'll need to commit to future purchases. Character development is one of the Trails series's strong suits. Much like the Tales of series, characters in Trails receive a lot of time and attention, providing layers of complexity to their personalities. Lesser games would be content to start and stop with common tropes (and those tropes are present here, to be fair), but even trope-y characters in Trails of Cold Steel feel like fully realized people. Like Alise, for example, who starts off as the standoffish rich girl and transforms into an earnest and lovable character. Or the conflict between Jusis and Machias, a nobleman and a commoner respectively, whose onenote relationship (they can't stand each other!) might have stayed that way in a lesser game, but here becomes the centerpiece for one of the story's central morals. Still, even with a strong story and excellent characters, it wouldn't be much of an RPG without a decent combat system. Trails of Cold Steel does far better than that. Combat is loaded with so many different options, it can seem overwhelming at first. At its core, battles are turn based. Portraits of your characters and enemies appear in a column to the left of the action, which shows the upcoming turn order. When it's your turn, you have several options. You can attack, use items, or move freely around the field, which will always be a circular arena. You also have the option of using Arts, which are the game's magic spells, or Crafts, which are more akin to special techniques. Each character learns a decent handful of unique Crafts throughout the game, and knowing when to use them is crucial to succeed, particularly on the higher difficulty levels. Certain Crafts have bonus effects, such as Impede, which stops an enemy who is in the middle of casting an Art. Since the battle order is laid out for you to see, you'll be able to strategize much more efficiently than if you were blindly guessing. Crafts use CP, which is a meter that fills up as you use basic attacks. Arts are managed by EP, which is much more like mana points in other RPGs. Speaking of Arts, you have a ton of leeway in how you choose to outfit your characters with magic. Each student of Class VII has an ARCUS, a special device that allows them to use Arts by placing different Quartz inside it. Quartz can do anything from giving you magic spells to increasing your stats. As you unlock slots in in your ARCUS, you'll be able to equip more spells and more stat boosts. You can find quartz in treasures chests, win them from enemies, or create them by spending Sepith, which are tiny shards affiliated with the elements that you'll earn in battle. Each ARCUS allows a student to equip one Master Quartz, as well, which can level up and gain new abilities and extra stat boosts for the character. It takes more than simply equipping the best items to be successful in battle, though, and that's where the Link system comes into play. Each student can form a Link with another student, which allows them to support each other in battle. When one character exploits an enemy's weakness, for example, their Linked partner can jump in with an extra attack. As you fight alongside your friends, you'll gain Link experience with them, and leveling up your Link gets you access to even more Link abilities. Another way to build Links is to spend time with your teammates outside of battle. Much like the Persona series, Rean can choose to get to know different characters better in optional scenes. During free days, you'll have access to a variety of side quests, and along with that, you'll get a certain number of Bonding Points to spend on conversations with other students. Your choices are more limited here than in, say, Persona 5 (you can only bond with certain characters on certain days, for example), but it further emphasizes the game's focus on character development and provides you a nice boost to Link experience at the same time. However, with as much as there is to recommend this game based on its story and combat alone, it's far from perfect. Graphically, this wasn't a powerhouse even on the PlayStation 3. The additional layer of polish present in the PS4 version is nice -- primarily improved texture resolution and the like -- but you'll in no way be fooled into thinking this is a current-generation game. The animation is very, very bad, too. If anything, it's the element that shows just how low this game's budget must have been. Characters move with the stiffness and awkwardness of an early PlayStation 2 game. However, if a developer has to choose to allocate money to something, I'm definitely in the group that prefers it go to story and combat over aesthetics. Trails of Cold Steel has the plot and battle system of a much higher-budget game. Musically, things are pretty solid. There are a handful of standout tracks, but for the most part, it's inoffensive, standard JRPG-style music. Special mention goes to the battle tracks, which are catchy and feature the sorts of wailing guitars and pounding bass you would expect, coupled with hummable melodies that stick in your head. The voice work is where the game really shines, though. There's something to be said about talented actors -- and there are talented actors involved in the English dub for sure -- but what stood out the most to me was the obviously skilled direction at play. So often in English dubs, it's clear how a line should be read, based on the context of a scene, but the line is read with incorrect intonation. That rarely, if ever, happens here. The actors seem to have been given a great amount of information, both about their characters and about the scenes they were performing, and it shows. You can bring in all the AAA actors you want (with their accompanying fees), but without good writing and directing, you end up with Peter Dinklage in Destiny. My hat is off to whoever at XSEED made this happen. Also, it's worth noting that thousands more voiced lines were recorded for this re-release. For whatever reason, in the original version, a bunch of Rean's lines were unvoiced. The other characters spoke, but… not Rean. It was a very odd experience and hurt the immersion, for sure. It wasn't a dealbreaker, but it's fantastic that the team was able to go back and make this better. Of course, if you prefer a subtitled experience, the PS4 remaster offers Japanese audio as an option, as well. Either way, you'll want to adjust the audio settings as soon as you can. The default mix makes it difficult to hear the dialogue over the bombastic opening music. The game also offers a Turbo mode, which speeds things up greatly. It makes exploring dungeons less of a drag, particularly the Old Schoolhouse, which you'll have to visit multiple times over the course of the game. If you're already a fan and are upgrading from the PS3 version, there's an option available to import your save data from that version to this one. I couldn't get this feature to work in my (pre-release) copy of the game, but it looks like any issues have since been cleared up. Trails of Cold Steel ranks as one of my favorite JRPGs, and this fresh coat of paint only makes me love it more. With Trails of Cold Steel II coming soon, and the brand-new PS4-exclusive Trails of Cold Steel III hitting our shores this fall, it's a great time to jump on board this amazing series.